"Don't you love my cute tail?" Masagon is a rather mediocre Monster. With all of its stats except for its HP stat being more or less the same, it really doesn't have anything outstanding in terms of stats. However, not all is bad for Masagon. While it won't be OHKOing Monsters outside of its own class, it has some nice tricks up its sleeve. For one thing, it has access to two outstanding abilities: Defense Decreaser and Expert Regnerator. Defense Decreaser can be used for a more offensive set, while Expert Regenerator can be used for a bulkier set, or with an offensive set for general healing. Masagon also can get some great type coverage with moves like Earth Shaker, Leaf Sword, Drake Claw, and Shadow Blade. In addition, Masagon has access to the move Knife Dance, which is an excellent move that increases Masagon's Attack stat by two stages. Masagon's Grass/Fighting typing gives it a lot of resistances and only a few weaknesses, which is always good. In addition, Masagon's HP stat makes it a fairly bulky Monster, which is helpful. Some things that don’t go so well for Masagon are its lackluster Defense and Special Defense stats, as well as its below average Speed stat. However, even with those drawbacks, Masagon can be used to be an effective sweeper if used correctly. The main objective of this set is to use Knife Dance when you can safely, and then proceed to sweep with the moves of your choice. Leaf Sword is the ultimate STAB move on this set, as it will rip through anything that doesn't resist it. The Razor Claw will increase Masagon's physical moves by 30% and decrease Masagon's special moves by 20%, but the latter fact is not relevant due to this entire set being a physical sweeper set. Masagon will definitely be able to tear apart teams that are not prepared for it after a Knife Dance boost. Earth Shaker and Land Slide give Masagon some nice type coverage. Earth Shaker will deal large amounts of damage to Monsters such as Ironate, Volshii, Chimernue, and some other Monsters. Land Slide can be used for some great coverage with Earth Shaker, or Shadow Blade can be used to deal with the plethora of Ghost-type Monsters out there. The TPs in this set help give Masagon the greatest potential to sweep. The 396 TPs in Attack and Speed are necessary for Masagon to out speed certain opponents and hit them hard. The 4 HP TPs give Masagon a tiny bit of bulk, and having some extra bulk is always useful. However, if you want to completely max out your Attack or Speed, you can move the 4 TPs from HP and transfer them to either Attack or Speed, depending on what would be best for your team. Having 4 TPs is ultimately going to be your best choice, however, due to the extra bulk. While it is difficult to come up with the nature you want, and even more so with a starter Monster, the most optimal nature for this specific set would be Trembling, as it gives Masagon extraordinary HP, Attack, and Speed, helping Masagon sweep easier. For the item, it is really up to you. You can either use the Razor Claw to maximize the power for all of your attacks, or you can use the Grass Orb for general healing purposes. Seeing as this is a sweeper set, it would be better to use the Razor Claw over the Grass Orb because the extra power will be very helpful. However, if you want this set to be a bit bulkier feel free to go with the Grass Orb. The ability Defense Decreaser is the best ability for this set, because it will lower the Defense of the opposing Monster and make it easier for you to sweep. 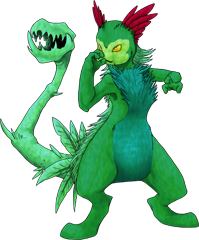 Dicaccio is a nice Monster to pair up with Masagon since it provides some synergy which will be helpful if Fire-type Monsters like Ironate give Masagon trouble. Pyrain is another great choice to pair up with Masagon, because it synergizes well with Masagon with its excellent Fire/Water-typing. Ironate will be able to completely destroy an unprepared Masagon, so make sure you have a counter ready to take care of Ironate before you proceed to sweep with Masagon. In addition, Inferror may give Masagon some trouble, so removing Inferror will be helpful before sending out Masagon. You're telling me that NOW? Haha, it's fine, hopefully the moves won't be edited that much. (2011-10-12, 10:19 PM)Lamb Wrote: You're telling me that NOW? (2011-10-12, 10:21 PM)Deidara Wrote: Lol. Well, we'll just work with what we have right now. Hey guys, I just wanted to let all of you know that I have updated the OP. I apologize for taking so long. I have been busy with my studies, so yeah. More sets will be coming soon. Also, after all the new moves have been added, I may edit the sets a little. Bump. It would be nice if I could get some feedback on the set I currently have written about in the OP, just saying. Can i make some ? Sure, we need all the help we can get. thank you lamb for everything.and void/dei/pein.